Imagine you’re selling at a market or expo and want to take credit cards. Rather than hassle with cash, you can use the new Android Payment Extension for the Google Checkout Store Gadget on your laptop to allow Checkout customers to purchase from their phones. 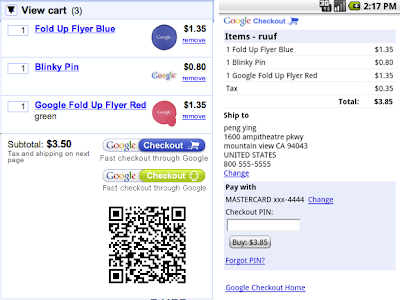 Once your customer tells you the items he or she wants to buy, you can create a cart with those items on your laptop. 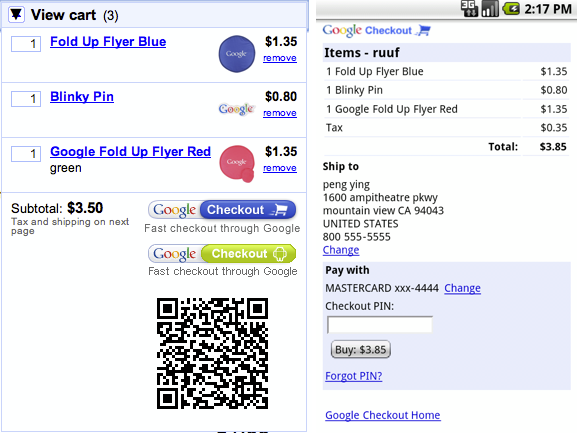 You then click the green Checkout with Android button and have the customer scan the QR code displayed with their phone. The QR code directs your customer to the buy page where they can complete their purchase. While this payment method may not be perfect for all cases, we hope you find it useful for setting up a shop on the go and that it inspires further innovation in the mobile and payment developer communities.